Squat, grooved and tawny; huge and mottled in red-orange; spherical and white; flat, with awning-stripes; classic orange orbs … I took two of each pumpkin-type Von’s was offering. Arranging them in different combinations, varying both sizes and colors, I came up with three stacks I really liked … but they seemed too low just sitting on the ground at the Rancho’s back gate. Looking around for something to raise them up, I caught sight of three tall metal plant stands in the garage. After some reconfiguring for balance, the stacks look terrific … The color-drenched gourds really stand up to the almost silly frilliness of the stands and together they say, “Welcome, Halloween celebrated here!” in a new way. Here, I was playing against the notion of the pumpkin being a lantern, by instead putting the pumpkin inside one. 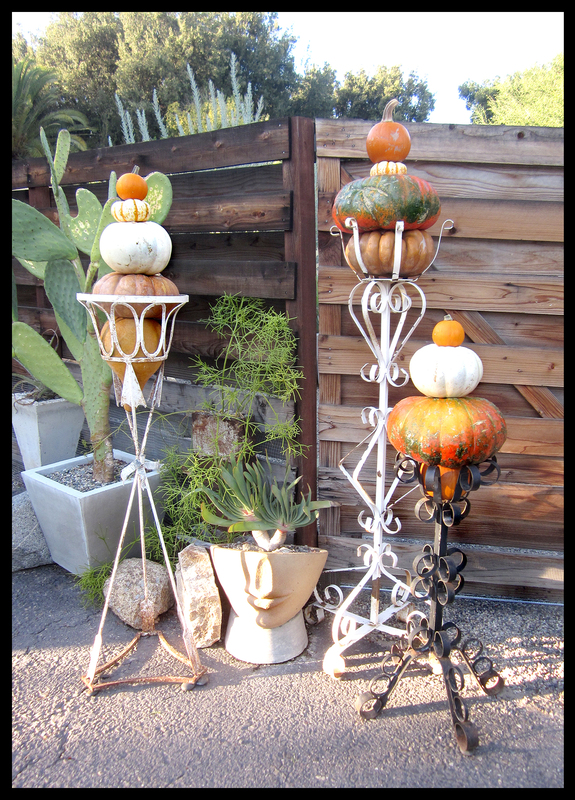 Actually, a tall painted metal lighting fixture, I raised it by placing it atop another metal planter stand and added the pumpkin stacks. Surrounding it are a newly acquired collection of old metal lanterns with votive candles. 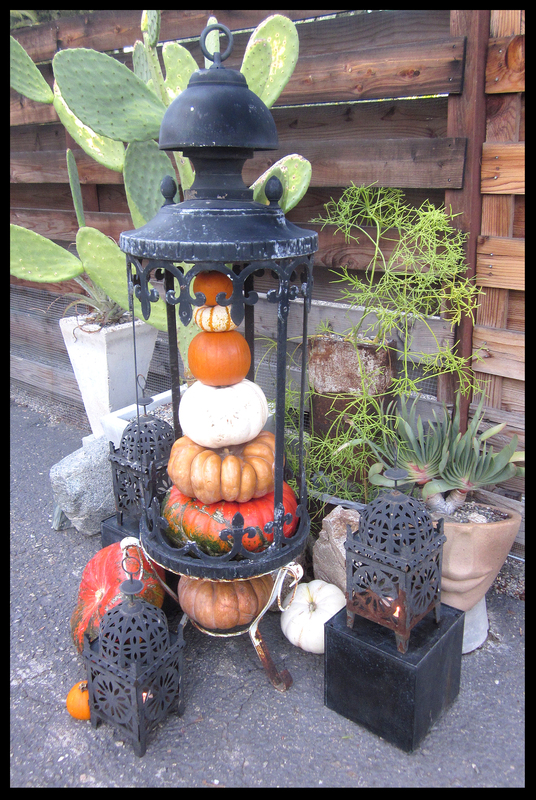 The goth-y black lanterns lend the squash a quality of exotica … candles lit, this would look hot come Halloween night! 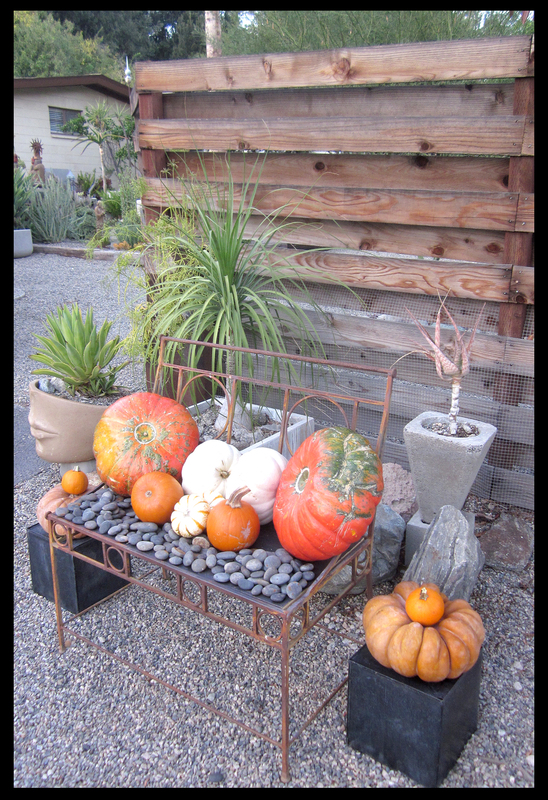 The largest pumpkin’s undersides look like big, squashy throw-pillows … and, we have an old metal bench without upholstery … you wouldn’t sit on it, but wouldn’t this pumpkin-padded bench look great flanking a front door? I added black river rock detail for textural interest and stacked pumpkin end tables to complete this All Hallow’s Eve tableau. One of my fave details at garden designer Dustin Gimbel’s place were stacked hypertufa balls on skewers (see them here). I borrowed that idea for this last look. 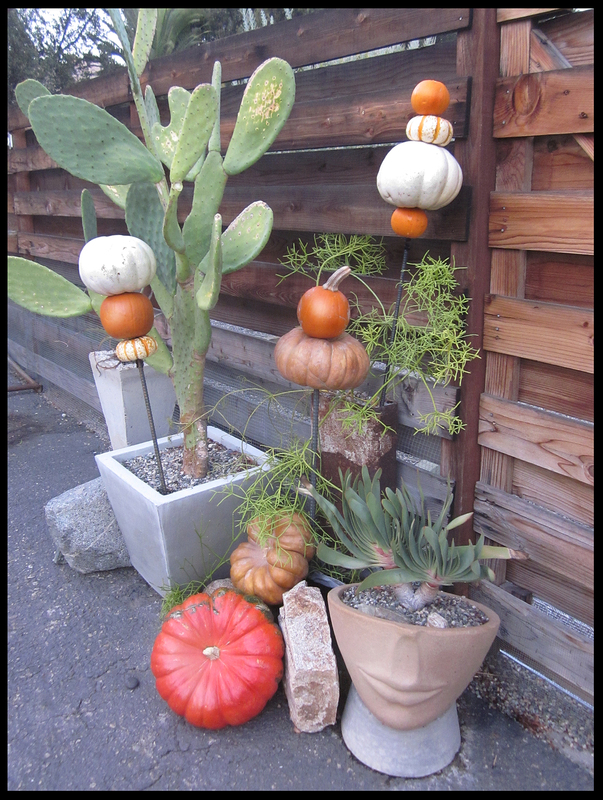 Using short lengths of rebar, I simply drilled holes in the pumpkins and threaded them on. To make sure the ‘kins stayed in place I added black metal binder clips beneath the bottom pumpkin; they’re virtually invisible and very strong. It’s best to use only the smaller pumpkins for this project; the weight of the larger ones was just too much and they were too unbalanced to stay upright. Thanks, Mic, for the inspiration, and happy Halloween! Love that first photo! Maybe it’s not to late to add a few pumpkins to the danger garden to celebrate the season. Well, I have two awesome towers that will be revealed in their new home soon… well, as soon as I figure out what to do with ’em next … I’m almost there! Those Pump-sicles are the best ! Mass-produced Halloween festivities are going full throttle everywhere I look, and I vowed not to participate, not that I find it at all tempting…but, what you’ve started at RR with Pumpkin Pops et al is very appealing. And thanks for the link to such a nice blog, Loonyville. Isn’t Loonyville nice… I like that it’s about lots of things and is very personal … Mass-produced Halloween: shudder! LOVE IT!! You have taken the pumpkins to a whole new level; pumpkins everywhere will never be the same (smile). Thanks, Britney, see you soon!